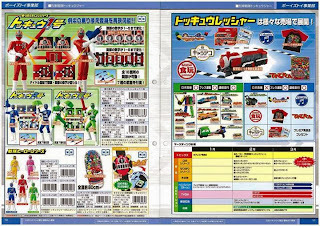 Toku Insider: Ressha Sentai Tokkyuger Catalog Pics! Notes about the toyline: The collectible gimmick, the TokkyuResshars, act not only as personalized henshin devices, but as mecha and powering methods for the rangers' weapons. That means the entirely toy line works together. Combined from the core 5 TokkyuResshar- RedResshar, BlueResshar, YellowResshar, GreenResshar, PinkResshar. TokkyuBlaster- The Tokkyuger's common arms. Can switch from Uchimasu Mode (Firing Mode) to Kirimasu Mode (Cutting Mode). 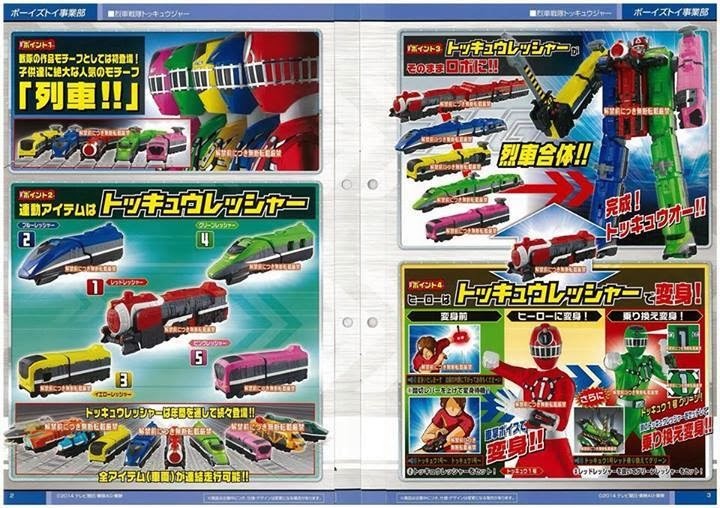 Comes with a TokkyuResshar, the "ScopeRessha" which combines with TokkyuOh, switching out for the left hand. TokkyuBuckle- The Tokkyuger's belt buckle. Holds the "Rainbow Pass". 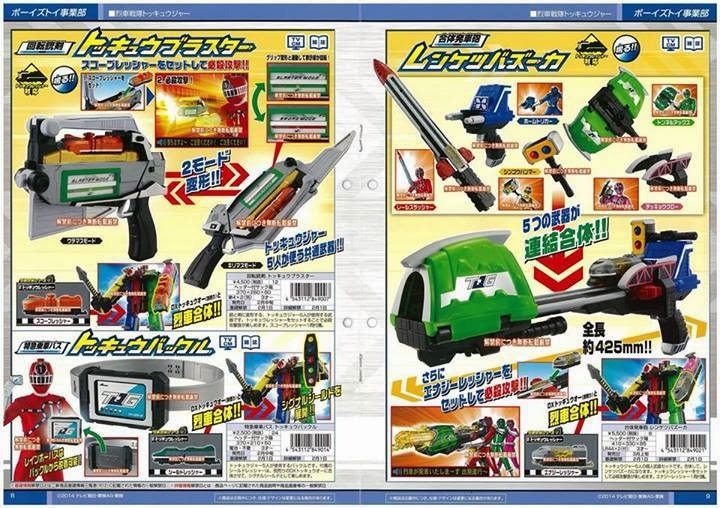 Comes with with a TokkyuResshar, the ShieldResshar, which forms the Signal Shield for TokkyuOh. Renketsu Bazooka- A team cannon formed from the Tokkyuger's personal weapons. Ichigo has the Rail Slasher, Nigo has the Form Trigger, Sango has the Shingo Hammer, Yongo has the Tunnel Axe, and Gogo has the Tekkyou Claw. 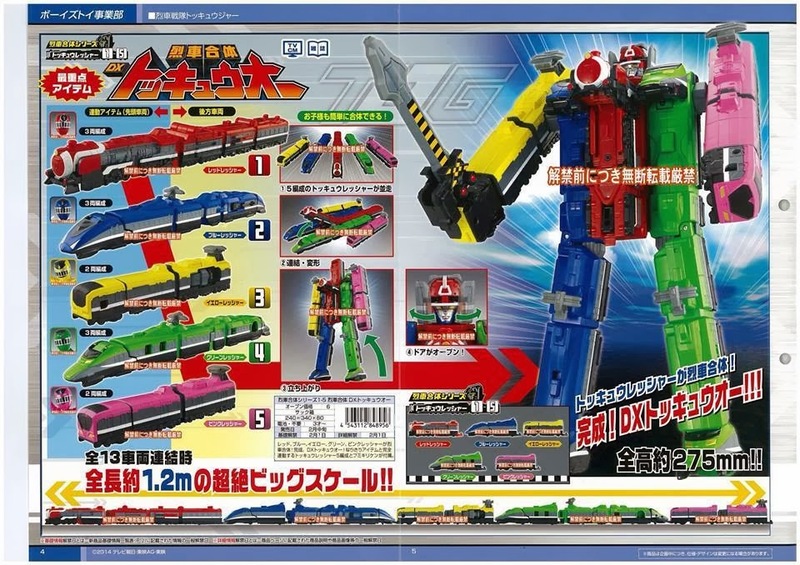 Comes with the TokkyuResshar, EnergyResshar, which can combine with TokkyuOh by replacing the left arm. 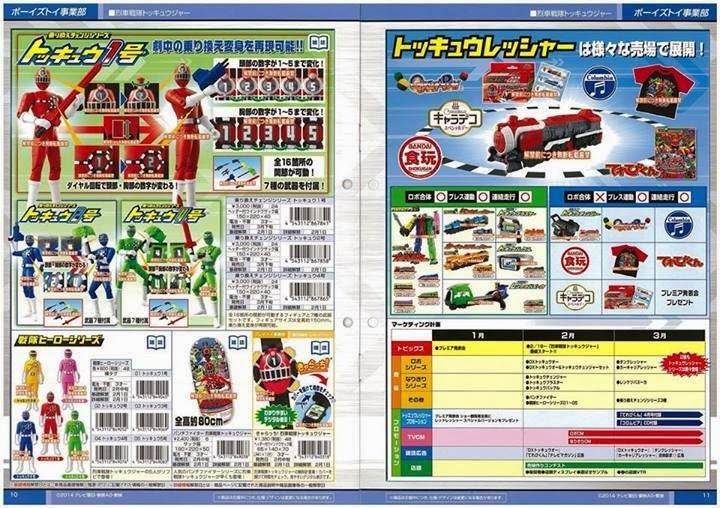 Action figures of Ichigo, Nigo and Sango. 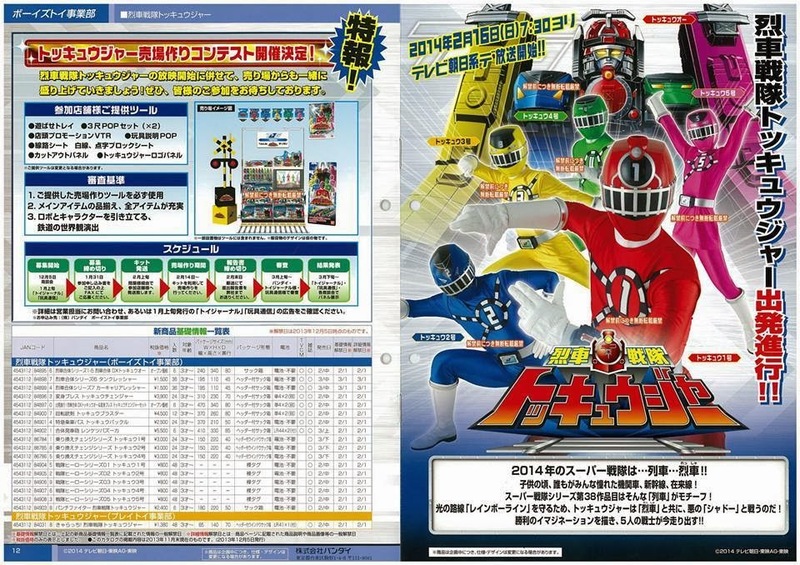 It seems the Tokkyuger have the ability to "transfer", which changes the numbers on their suits and allow them to use the other rangers' powers. (Note Red holding Blue's weapon, and so on and so forth.) Under that are the usual bonus toys- SH figure series, punching bag and watch. 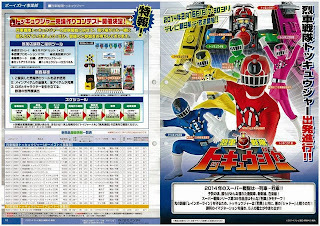 The Tokkyuger's changer. 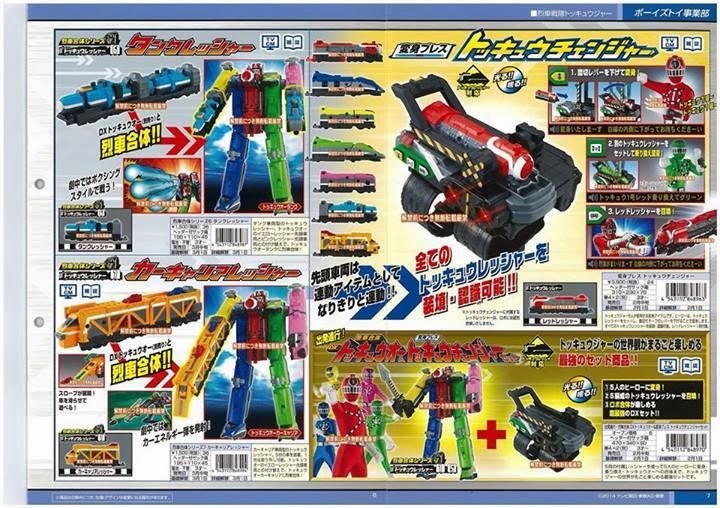 Each ranger loads a different TokkyRessha into the changer to transform. 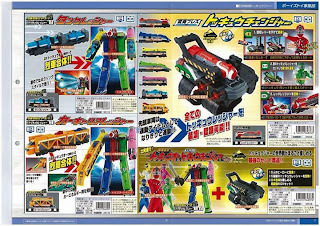 The TokkyuRessha in turn double as their mecha and our collection gimmick this year. 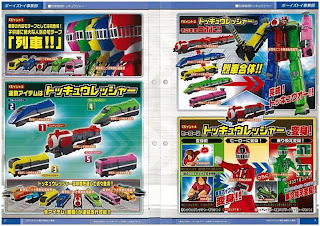 A set of both TokkyuOh and the Changer will be released as well.